After using the AVR-ISP mkII for years (actually the cheap eBay knock-offs) to program ATMEL AVR microcontrollers, today I gave the Bus Pirate a shot. Far more than just a microcontroller programmer, this little board is basically a serial interface to basic microcontroller peripherals. In a nutshell, you plug it in via USB and it looks like a serial port which has a command-line interface that lets you do things like turn pins on and off, perform voltage measurements, and it naively supports bidirectional use of common protocols like I2C, SPI, UART, and even HD44780 series LCDs. Note that although you could directly interface with the Bus Pirate using HyperTerminal, I recommend using TeraTerm. It can supply voltages (3.3V and 5V) to power small circuits, and if current draw is too high (indicating something is hooked-up wrong) it automatically turns the supply off. So clever! At <$30, it’s a cool tool to have around. In addition, it’s naively supported as an AVR programmer by AVRDUDE. Although I could write assembly to perform tasks, I almost always write in C for the convenience. For my reference (and that of anyone who may want to do something similar), I’m posting the simplest-case method I use to program AVR microcontrollers with the Bus Pirate on Windows (noting that Linux would be nearly identical). I also wrote a Python script to connect with the Bus Pirate and run simple commands (which turns the power supply on and report the voltage of the VCC line immediately after programming completes). Yes, there are fancy packages that allow you to interact with Bus Pirate from Python, but the advantage of my method is that it runs from native Python libraries! To get this all up and running for yourself, just install WinAVR (which supplies AVRDUDE and AVR-GCC) and Python 3. I assume this code will work just as well on Python 2, but haven’t tried. To ensure my Bus Pirate is working properly, I start off by running the Bus Pirate’s built-in test routine. For full details read the guide. It just involves connecting two pairs of pins together as shown in the picture here, connecting to the Bus Pirate with the serial terminal, and running the command “~”. It will output all sorts of useful information. Once I know my hardware is up and running, I’m good to continue. Here’s the code which runs on the microcontroller to twiddle all the pins (saved as main.c). Note that my MCU is an ATTiny85. I’m using standard clock settings (internal RC clock, 8MHz), but if I wanted to modify fuses to do things like use an external clock source or crystal, I’d calculate them with engbedded’s handy dandy fuse calculator (which also shows AVRdude arguments needed to make the change!). To compile the code and program the MCU with it, I always have a bash script in the same folder that I can double-click on to delete old compiled files (so we don’t accidentally re-program our MCU with old code), compile main.c, and load it onto the MCU using the Bus Pirate. You may have to change COM3 to reflect the com port of your Bus Pirate. Note that it is required that you disconnect other terminals from the Bus Pirate before doing this, otherwise you’ll get an “access denied” error. Although the programmer briefly supplies my MCU with power from the +5V pin, it’s cut after programming completes. Rather than manually re-opening my terminal program, re-connecting with the bus pirate, re-setting the mode (command “m”) to something random (DIO, command “9”), and re-enableing voltage output (command “W”) just to see my LED blink, I want all that to be automated. Thanks python for making this easy. The last line calls “up.py”. This fancy script even outputs the voltage of the VCC line after it’s turned on! """python3 control of buspirate (SWHarden.com)"""
"""send the command and listen to the response.""" ser=serial.Serial(BUSPIRATE_PORT, 115200, timeout=1) # is com free? send(ser,'W') # turn power supply to ON. Lowercase w for OFF. This is a minimal-case scenario, but can be obviously expanded to perform some complicated tasks! For example, all commands could be run from a single python program. Considering the Bus Pirate’s ability to communicate with so many different protocols (I2C, 2-write, etc. ), being able to naively control it from Python without having to install special additional libraries will certainly prove to be convenient. PS: I noted there is a surprising delay when initializing programming the AVR with the bus pirate. The process hangs for about 10 seconds after the bus pirate introduces itself with the welcome message, then seems to resume at full speed writing to the flash of the microchip. After a bit of Googling, I believe the delay is due to the Bus Pirate slowly bit-banging SPI to initialize the programming sequence. The AVR has rich SPI functionality, some of which involves its own programming. Satisfied with this answer for now, I’m not going to try to speed it up. It’s a little annoying, but not too bad that I won’t use this to program my AVRs. The oven then cycles on and off roughly every thirty or forty seconds and hovers around 40 degrees-C thereafter to within better than one degree-C. I wondered how much this on/off heater cycle affected temperature. Is it negligible, or could it affect frequency of an oscillator circuit? Indeed his application heats an entire enclosure so small variations get averaged-out by the large thermal mass. However in crystal oven designs where only the crystal is heated, such as described by Bill (W4HBK), I’ll bet the effect is much greater. Compare the thermal mass of these two concepts. Right off the bat, I realized that this requires a PC interface. Even if it’s not used to adjust temperature (an ultimate goal), it will be used to log temperature and power for analysis. I won’t go into the details about how I did it, other than to say that I’m using an ATMEL ATMega8 AVR microcontroller and ten times I second I sample voltage on each of it’s six 10-bit ADC pins (PC0-PC5), and send that data to the computer with USART using an eBay special serial/USB adapter based on FTDI. They’re <$7 (shipped) and come with the USB cable. Obviously in a consumer application I’d etch boards and use the SMT-only FTDI chips, but for messing around at home I a few a few of these little adapters. They’re convenient as heck because I can just add a heater to my prototype boards and it even supplies power and ground. Convenient, right? Power is messier than it could be because it’s being supplied by the PC, but for now it gets the job done. 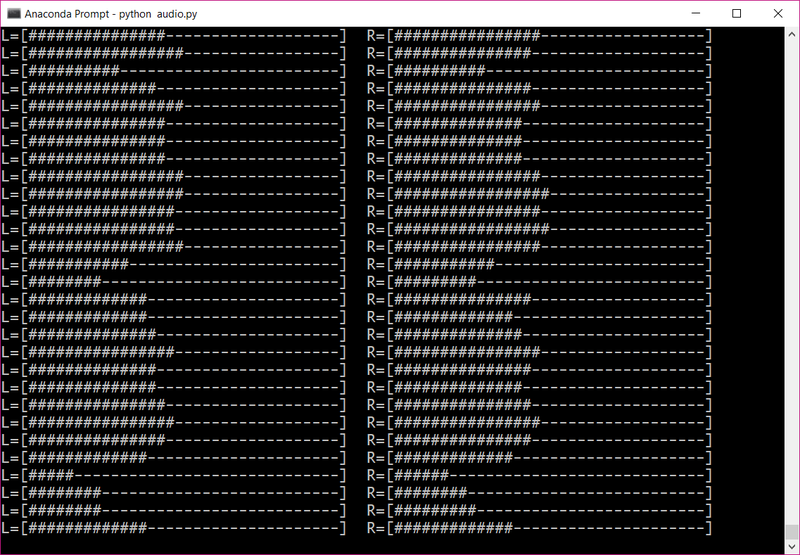 On the software side, Python with PySerial listens to the serial port and copies data to a large numpy array, saving it every once and a while. Occasionally a bit is sent wrong and a number is received incorrectly (maybe one an hour), but the error is recognized and eliminated by the checksum (just the sum of all transmitted numbers). Plotting is done with numpy and matpltolib. Code for all of that is at the bottom of this post. I then build the temperature controller part of the circuit. It’s pretty similar to that previously published. it uses a thermistor in a voltage divider configuration to sense temperature. It uses a trimmer potentiometer to set temperature. An LED indicator light gives some indication of on/off, but keep in mind that a fraction of a volt will turn the Darlington transistor (TIP122) on slightly although it doesn’t reach a level high enough to drive the LED. The amplifier by default is set to high gain (55x), but can be greatly lowered (negative gain actually) with a jumper. This lets me test how important gain is for the circuitry. When using a crystal oven configuration, I concluded high high gain (cycling the heater on/off) is a BAD idea. While average temperature is held around the same, the crystal oscillates. This is what is occurring above when M0AYF indicates his MK1 heater turns on and off every 40 seconds. While you might be able to get away with it while heating a chassis or something, I think it’s easy to see it’s not a good option for crystal heaters. Instead, look at the low gain (negative gain) configuration. It reaches temperature surprisingly quickly and locks to it steadily. Excellent. Here’s a similar experiment with a lower target temperature. Noise is due to unregulated USB power supply / voltage reference. Undeniably, this circuit does not oscillate much if any. Clearly low (or negative) gain is best for crystal heaters. What about chassis / enclosure heaters? Let’s give that a shot. I made an enclosure heater with the same 2 resistors. Again, I’m staying away from expensive components, and that includes power resistors. I used epoxy (gorilla glue) to cement them to the wall of one side of the enclosure. I put a “heater sensor” thermistor near the resistors on the case so I could get an idea of the heat of the resistors, and a “case sensor” on the opposite side of the case. This will let me know how long it takes the case to reach temperature, and let me compare differences between using near vs. far sensors (with respect to the heating element) to control temperature. I ran the same experiments and this is what I came up with! CLOSE SENSOR CONTROL, LOW/HIGH GAIN: TOP: heater temperature (blue) and enclosure temperature (green) with low gain (first 20 minutes), then high gain (after) operation. High gain sensor/feedback loop is sufficient to induce oscillation, even with the large thermal mass of the enclosure. BOTTOM: power to the heater (voltage off the op-amp output going into the base of the Darlington transistor). Although I didn’t give the low-gain configuration time to equilibrate, I doubt it would have oscillated on a time scale I am patient enough to see. Future, days-long experimentation will be required to determine if it oscillates significantly. FAR SENSOR CONTROL, HIGH GAIN: Even with the far sensor (opposite side of the enclosure as the heater) driving the operational amplifier in high gain mode, oscillations occur. Blue is the far sensor temperature. Green is the sensor near the heater temperature. Due to the larger thermal mass and increased distance the heat must travel to be sensed they take much longer to occur, leading them to be slower and larger than oscillations seen earlier when the heater was very close to the sensor. Right off the bat, we observe that even with the increased thermal mass of the entire enclosure (being heated with two dinky 100 ohm 1/4 watt resistors) the system is prone to temperature oscillation if gain is set too high. For me, this is the final nail in the coffin – I will never use a comparator-type high gain sensor/regulation loop to control heater current. With that out, the only thing to compare is which is better: placing the sensor near the heating element, or far from it. In reality, with a well-insulated device like I seem to have, it seems like it doesn’t make much of a difference! The idea is that by placing it near the heater, it can stabilize quickly. However, placing it far from the heater will give it maximum sensation of “load” temperature. Anywhere in-between should be fine. As long as it’s somewhat thermally coupled to the enclosure, enclosure temperature will pull it slightly away from heater temperature regardless of location. Therefore, I conclude it’s not that critical where the sensor is placed, as long as it has good contact with the enclosure. Perhaps with long-term study (on the order of hours to days) slow oscillations may emerge, but I’ll have to build it in a more permanent configuration to test it out. Lucky, that’s exactly what I plan to do, so check back a few days from now! Sensor location on an enclosure is not critical as long as it’s well-coupled to the enclosure and the entire enclosure is well-insulated. I feel satisfied with today’s work. Next step is to build this device on a larger scale and fix it in a more permanent configuration, then leave it to run for a few weeks and see how it does. On to making the oscillator! If you have any questions or comments, feel free to email me. If you recreate this project, email me! I’d love to hear about it. Here’s the code that went on the ATMega8 AVR (it continuously transmits voltage measurements on 6 channels). Here’s the command I used to compile the code, set the AVR fuse bits, and load it to the AVR. Here’s the code that runs on the PC to listen to the microchip, match the data to the checksum, and log it occasionally. print  lines, line, "<-- FAIL"
Here’s the code that runs on the PC to graph data. matplotlib.use('TkAgg') # <-- THIS MAKES IT FAST! In an effort to resume previous work [A, B, C, D] on developing a crystal oven for radio frequency transmitter / receiver stabilization purposes, the first step for me was to create a device to accurately measure and log temperature. I did this with common, cheap components, and the output is saved to the computer (over 1,000 readings a second). Briefly, I use a LM335 precision temperature sensor ($0.70 on mouser) which outputs voltage with respect to temperature. It acts like a Zener diode where the breakdown voltage relates to temperature. 2.95V is 295K (Kelvin), which is 22ºC / 71ºF. Note that Kelvin is just ºC + 273.15 (the difference between freezing and absolute zero). My goal was to use the ADC of a microcontroller to measure the output. The problem is that my ADC (one of 6 built into the ATMEL ATMega8 microcontroller) has 10-bit resolution, reporting steps from 0-5V as values from 0-1024. Thus, each step represents 0.0049V (0.49ºC / 0.882ºF). While ~1ºF resolution might be acceptable for some temperature measurement or control applications, I want to see fractions of a degree because radio frequency crystal temperature stabilization is critical. Here’s a video overview. This is the circuit came up with. My goal was to make it cheaply and what I had on hand. It could certainly be better (more stable, more precise, etc.) but this seems to be working nicely. The idea is that you set the gain (the ratio of R2/R1) to increase your desired resolution (so your 5V of ADC recording spans over just several ºF you’re interested in), then set your “base offset” temperature that will produce 0V. In my design, I adjusted so 0V was room temperature, and 5V (maximum) was body temperature. This way when I touched the sensor, I’d watch temperature rise and fall when I let go. Component values are very non-critical. LM324 is powered 0V GND and +5V Vcc. I chose to keep things simple and use a single rail power supply. It is worth noting that I ended-up using a 3.5V Zener diode for the positive end of the potentiometer rather than 5V. If your power supply is well regulated 5V will be no problem, but as I was powering this with USB I decided to go for some extra stability by using a Zener reference. On the microcontroller side, analog-to-digital measurement is summed-up pretty well in the datasheet. There is a lot of good documentation on the internet about how to get reliable, stable measurements. 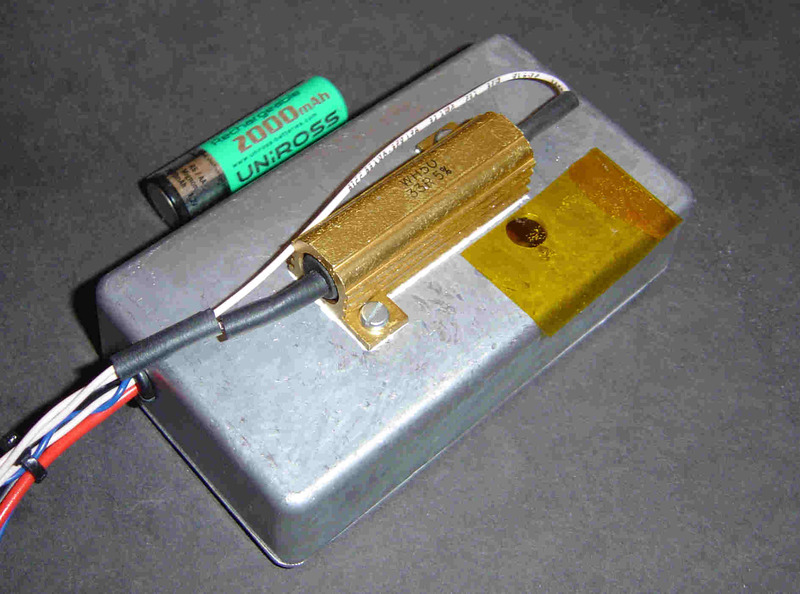 Decoupling capacitors, reference voltages, etc etc. That’s outside the scope of today’s topic. In my case, the output of the ADC went into the ATMega8 ADC5 (PC5, pin 28). Decoupling capacitors were placed at ARef and AVcc, according to the datasheet. Microcontroller code is at the bottom of this post. 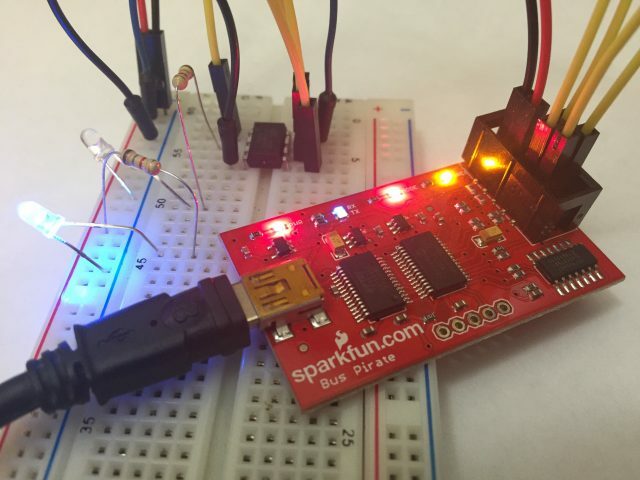 To get the values to the computer, I used the USART capability of my microcontroller and sent ADC readings (at a rate over 1,000 a second) over a USB adapter based on an FTDI FT232 chip. I got e-bay knock-off FTDI evaluation boards which come with a USB cable too (they’re about $6, free shipping). Yeah, I could have done it cheaper, but this works effortlessly. I don’t use a crystal. I set fuse settings so the MCU runs at 8MHz, and thanks to the nifty online baud rate calculator determined I can use a variety of transfer speeds (up to 38400). At 1MHz (if DIV8 fuse bit is enabled) I’m limited to 4800 baud. Here’s the result, it’s me touching the sensor with my finger (heating it), then letting go. Touching the temperature sensor with my finger, voltage rose exponentially. When removed, it decayed exponentially – a temperature RC circuit, with capacitance being the specific heat capacity of the sensor itself. Small amounts of jitter are expected because I’m powering the MCU from unregulated USB +5V. I spent a while considering fancy ways to send the data (checksums, frame headers, error correction, etc.) but ended-up just sending it old fashioned ASCII characters. 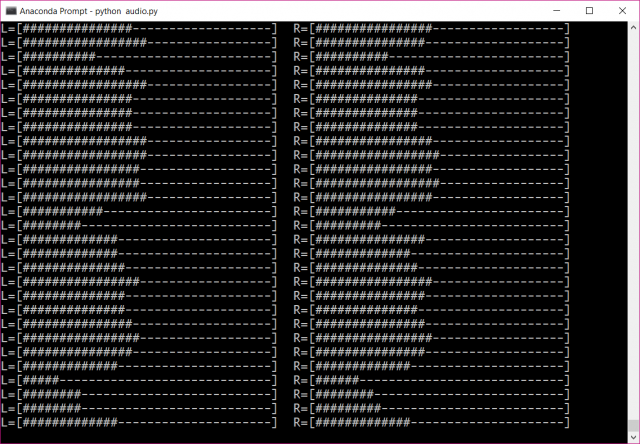 I used to care more about speed, but even sending ASCII it can send over a thousand ADC readings a second, which is plenty for me. I ended-up throttling down the output to 10/second because it was just too much to log comfortable for long recordings (like 24 hours). In retrospect, it would have made sense to catch all those numbers and do averaging on the on the PC side. I keep my house around 70F at night when I’m there, and you can see the air conditioning kick on and off. In the morning the AC was turned off for the day, temperature rose, and when I got back home I turned the AC on and it started to drop again. On the receive side, I have nifty Python with PySerial ready to catch data coming from the microcontroller. It’s decoded, turned to values, and every 1000 receives saves a numpy array as a NPY binary file. I run the project out of my google drive folder, so while I’m at work I can run the plotting program and it loads the NPY file and shows it – today it allowed me to realize that my roomate turned off the air conditioning after I left, because I saw the temperature rising mid-day. The above graph is temperature in my house for the last ~24 hours. That’s about it! Here’s some of the technical stuff. If you recreate this project, or have any questions, feel free to email me!